We arrived at the Salvador Dalí Theatre Museum in the Spanish city of Figueres by way of St. Petersburg, Florida—three years and thousands of miles later. Before being introduced to Dalí’s work in the Sunshine State in 2011, neither Brian nor I was all that familiar with him beyond his curled, signature mustache and Surrealist paintings. 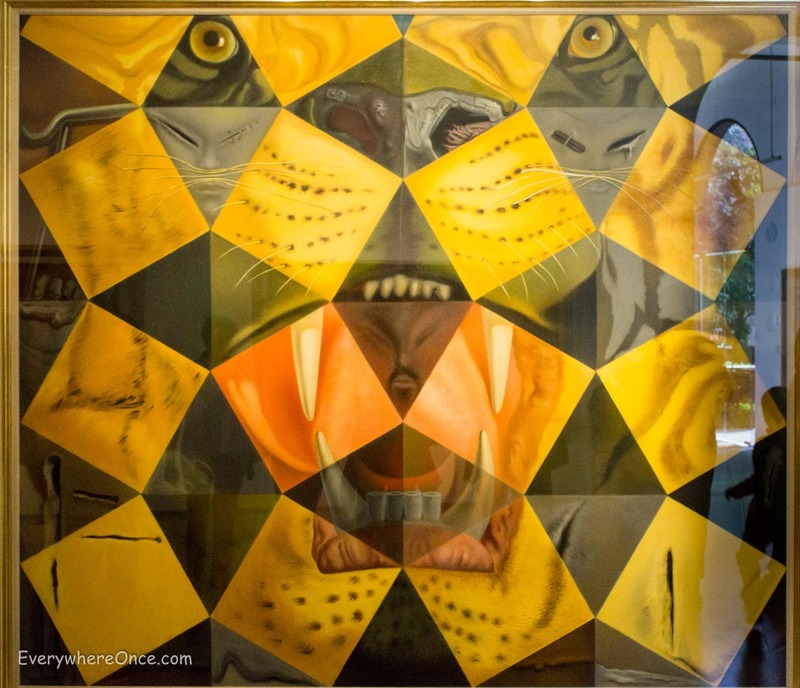 In fact, as we discovered at the Salvador Dalí Museum in St. Petersburg, there was much more to this multi-dimensional artist than a melting clock. A single Surrealist painting purchased by art-loving newlyweds Reynolds and Eleanor Morse in 1941 was the first piece in the Dalí treasure trove they amassed and which eventually became the basis for the St. Petersburg museum. 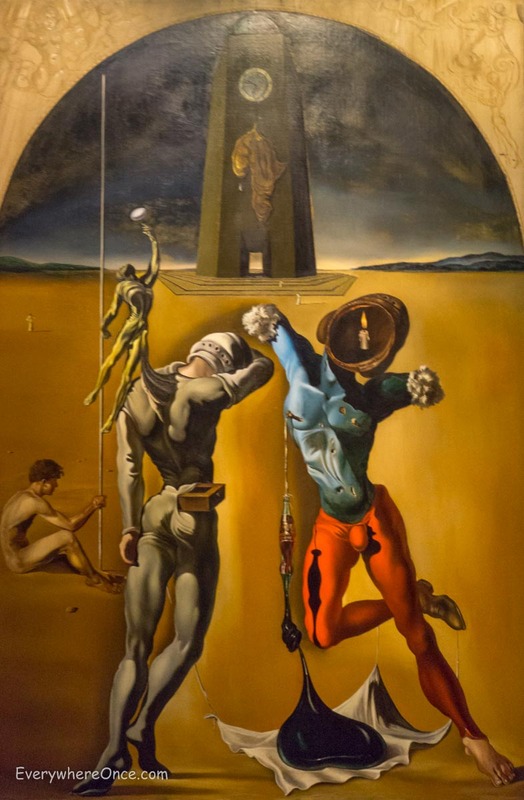 Dali’s paintings are presented chronologically, spanning 45 years, from Impressionism and Cubism to Surrealism and a classic period that focused on religion and science. He also dabbled in film and photography, created sculptures, and designed jewelry, clothes, furniture, and sets for plays and ballet. We left the museum intrigued by the wonderfully offbeat sensibility that conjured images like a fast-moving still life, the artist Vermeer’s ghost doubling as a table, and bicycle-riding skeletons balancing rocks on their heads. That was the warm-up act. 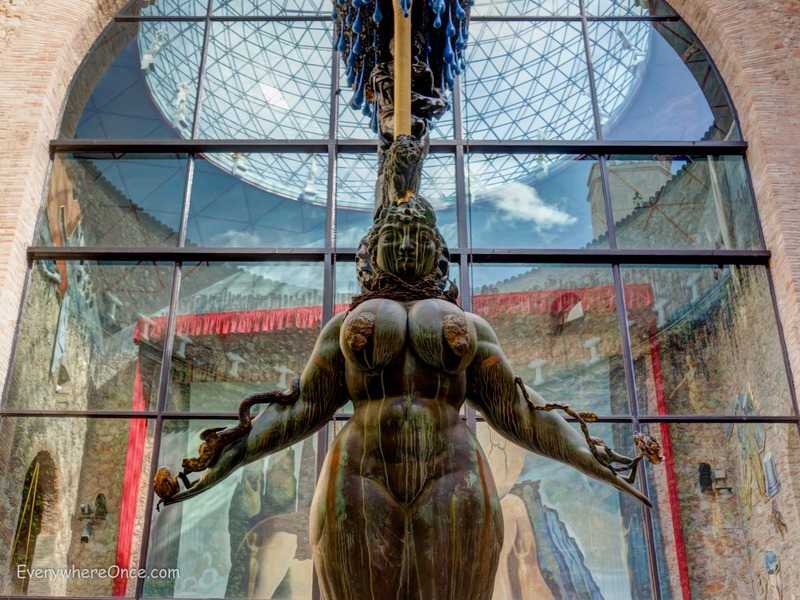 While the St. Petersburg museum offers a superbly informative, third-person overview of Dalí’s career, the one in Figueres was conceived, designed, and staged by the artist himself. Built on the site of a former theatre, left in ruins after the Spanish Civil War, it’s not your typical gallery. 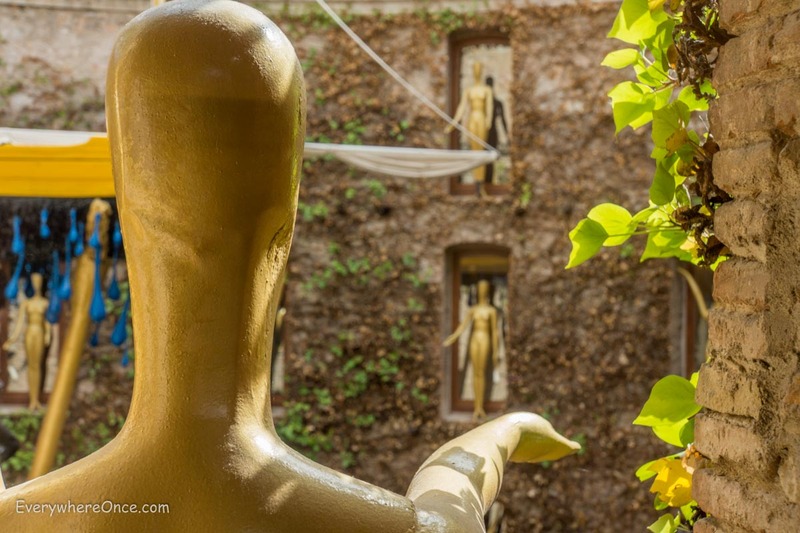 It’s bold and flamboyant, “a totally theatrical museum,” declared Dalí, who was born in Figueres. If the huge number of people drawn to this out-of-the-way town each year is any indication, strange trumps staid. 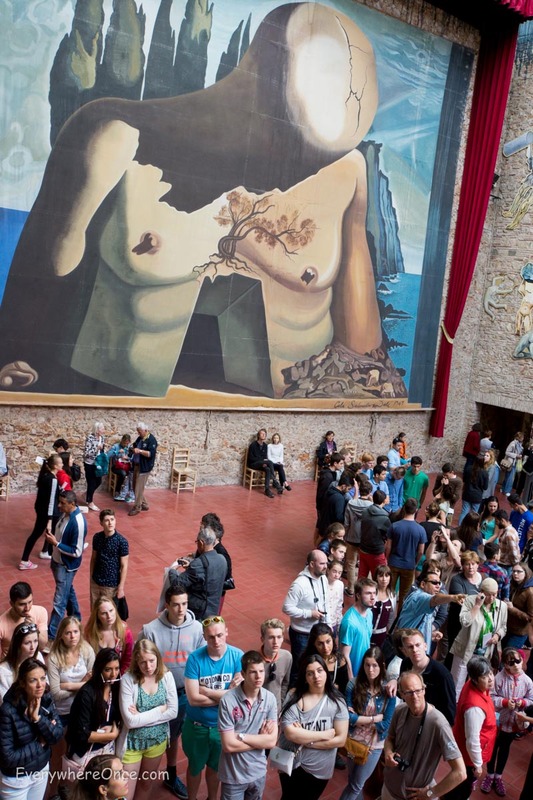 The Salvador Dalí Theatre Museum is reportedly the third most popular museum in Spain, after the Prado in Madrid and the Guggenheim in Bilbao. We arrived just after opening time on a weekday morning and found ourselves elbow to elbow with other visitors gawking at Dalí’s handiwork. By the time we left several hours later, the admission line extended out of the museum’s main entrance and snaked down the street, as hundreds more waited for their turn inside. In the courtyard, a statue of Queen Esther stands atop a black Cadillac owned by Dalí and rumored to have once been Al Capone’s ride. Yup, those are cobalt blue, resin-coated condoms emulating water dripping from the boat suspended above her head. Gilded figurine statues perch on parapets above the courtyard. Face of Mae West Which Can Be Used as an Apartment. 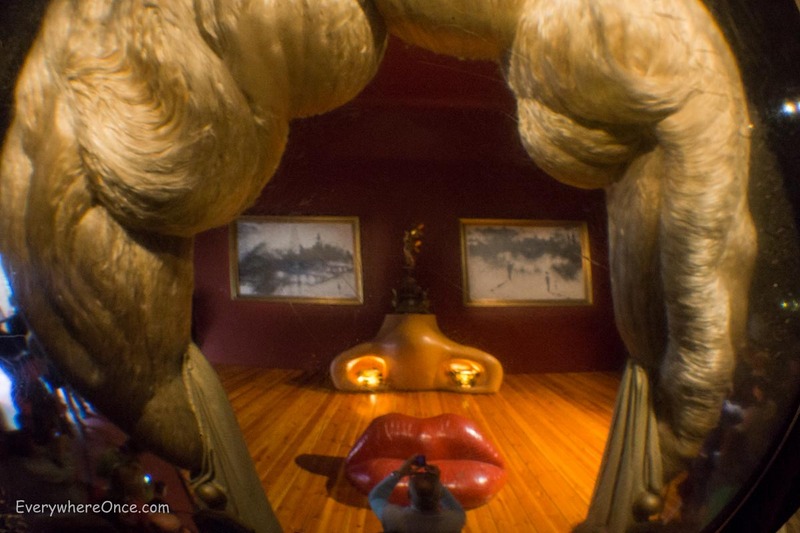 Seen up close, it’s living room furniture; from atop a specially-positioned set of stairs, it’s actress Mae West’s visage. Another of Dalí’s optical illusions: Phantom Cart. 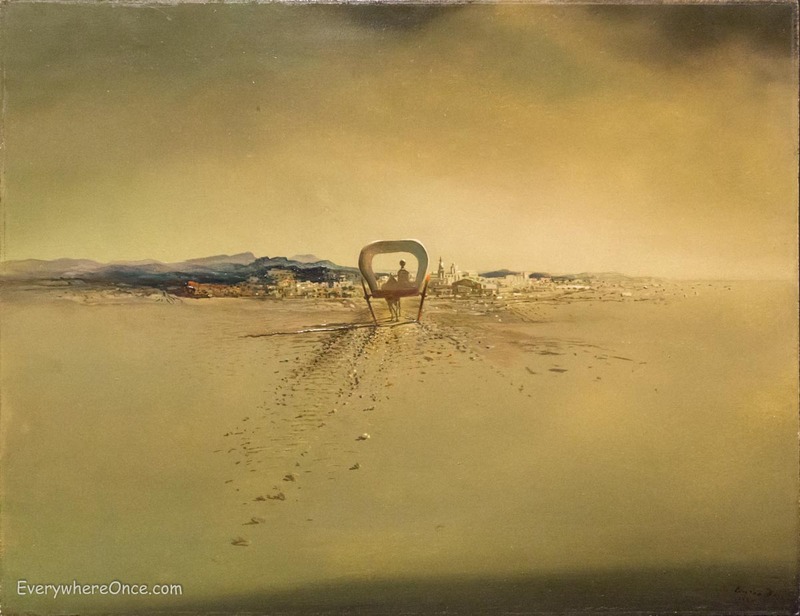 Two figures seated in a wagon are also part of the distant cityscape they’re heading toward. One of Dalí’s quieter, lesser-known works, it kept us riveted for a while. 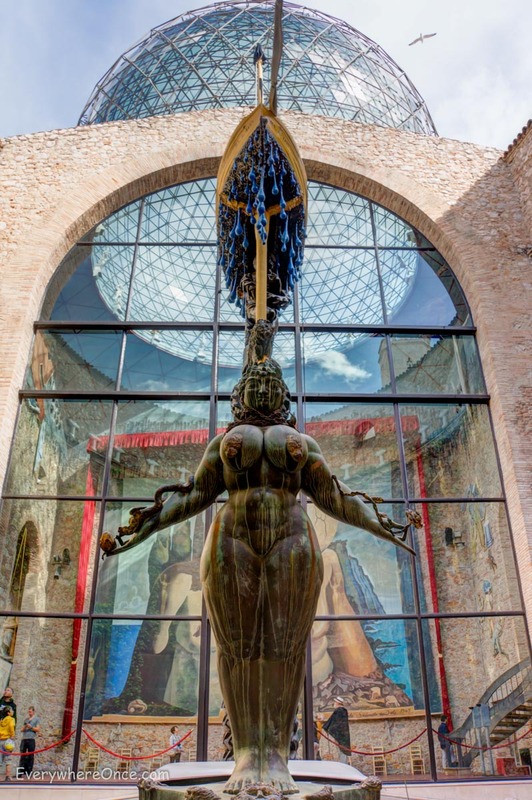 I’ve been to the Dali museum in Figueres almost 25 years ago, and I remember it as one of the most stirring museums I’ve ever been in. Thankyou sharing your visits Dali museums on two sides of the world. The man certainly mixed a unique view of the world with remarkable talent. We must remember to make the effort to turn up early to iconic places and maximize the experience by minimizing the crowds. Beautifully captured images Brian, I especially like the shot looking back down at those who are looking up to admire the mysterious piece that is out of view.